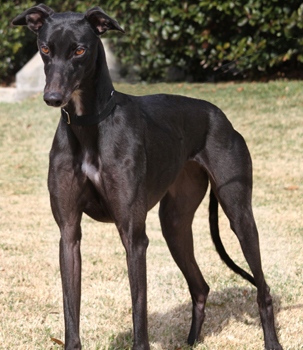 Glamour Girl, aka CTW Glamathon, is a beautiful 2½-year-old black female born April 9, 2008. 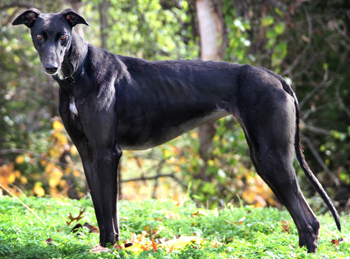 Her sire is Flying Stanley, and her dam is Greys Gravity. Glamour Girl raced in 45 races at Birmingham, the last one on 9/22. Now, here is this friendly sweet girl, ready to find her forever home! It is not known at this time if Glamour Girl is small animal or cat tolerant. My name is Glamour Girl and that's a good name for me as I am a bit of a princess. I lay down very pretty, like a lady, but I only like to lounge on soft beds, no hard floors for me! I love to go outside and lie in the sun and I LOVE a good roll in the grass! I am very social, following the other dogs (and my foster mom) all over. I get along with every dog I meet; my foster mom says I am "fabulous" with other dogs, but I have not met any small dogs yet. I don't play rough, but I do de-squeak a stuffy occasionally. Those stuffies need to learn their place, after all. I love treats, any treats, and I am very food motivated. I also like to chew on bones sometimes. I really like my crate as that is where I sleep and eat... foster mom calls it "breakfast in bed". I don't walk on the leash very much as I have a large fenced yard to run in, but the times I have been on a leash I did not pull much. I have never had any accidents in the house or in my crate. I am very affectionate and love to lean on you and get all the petting and scritches I deserve. which is a lot! My one fault is that I love to discover what's on the counters. If you leave food or plastic where I can reach it, I will eat it! 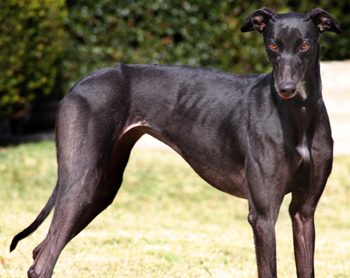 If you are looking for a tall, long-legged affectionate girly girl then I am the hound for you. All you have to do is supply the soft comfy bed and lots of treats and I will be happy to give you all the greyhound love you can handle!